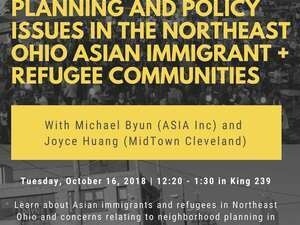 Michael Byun (ASIA Inc) and Joyce Huang (MidTown Cleveland) will discuss Asian immigrants and refugees in Northeast Ohio and concerns relating to neighborhood planning in Cleveland's Asia Town. Students interested in immigration, community advocacy/organizing, and neighborhood development are especially encouraged to attend. A breakout session focusing on specific ways students can work with ASIA and MidTown (winter term and other internships) will immediately follow. This event is cosponsored by the Department of Comparative American Studies, the Bonner Center for Service and Learning, and the Multicultural Resource Center.